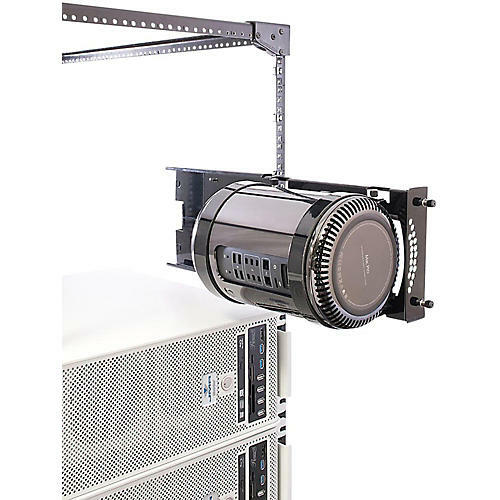 Sliding rack to mount a single Mac Pro into a cabinet or against a wall/pedestal. MPRO-HORZ: 7″h (4U) x 16″d, will install in all standard rack cabinets and most mobile rack carts. The new ProBracket mounts are the best way to protect your Mac Pro investment – with quick and convenient mounting under a desk, aside a desk pedestal, to a wall, or into a rack cabinet. With I-O ports readily available or hidden, the ProBracket includes cable management and secure, integrated straps that hold the Mac Pro in place, along with rubber gasketed “cradles” that protect it from vibration and scratches. Each ProBracket is finished in high-gloss black baked-on powder coating over 18 gauge galvanized steel for long life and ruggedness.